figure 3-11, have a gauge indicating a percentage of air loss. The gauge is connected to a spring- loaded diaphragm. The source of air is connected to the instrument and counterbalances the action of the spring against the diaphragm. By adjusting the spring tension, you can calibrate the gauge properly against a variety of air pressure sources within a given tolerance. The tachometer is a speed-indicating instru- ment that measures the rpms of a rotating shaft. It maybe either manually or electrically operated. 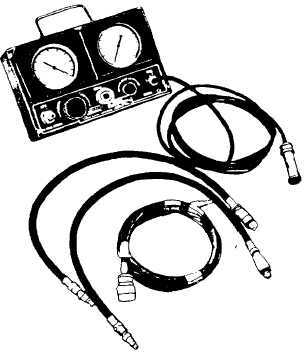 A manual tachometer (fig. 3-12) is held by its tip against the end of an exposed rotating shaft. Make sure the end of the shaft is clean and there is no slippage between the tip of the tachometer and the shaft. Read the speed directly on the tachometer dial, which is calibrated in revolutions per minute. 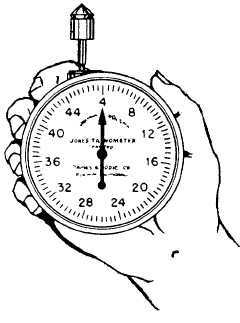 No timing is necessary, as variations in speed will be reflected by movement of the pointer on the dial during the test. Figure 3-11. - Cylinder leakage tester. Figure 3-12. - Manually operated tachometer. camshaft or fuel pump shaft. On four-cycle engines, this shaft runs at one-half engine speed. Consequently, any manual tachometer reading taken from this shaft must be doubled to get the true engine speed. The electric tachometer is connected to the ignition primary circuit to measure the number of times per minute the primary circuit is interrupted. It then translates this information into engine speed. The electric tachometer may have a selector switch on it that can be turned to correspond with the number of lobes on the distributor cam. The number of lobes will be the same as the number of cylinders in the engine. For the proper method of hooking up and using the electric tachometer, check the manufacturer's instructions for the tachometer you are using.